The average adult human brain contains approximately a hundred billion neurons used to inform and and operate the human machine. With all of that processing power, system support and design repetition it’s sometimes curious as to why the machine is such a fickle thing. All it takes is a moment for our mood to change. Ideas and complex concepts can form in seconds given the right amount of cognitive capacity. Even something as simple as the way a sentence is structured or the words we choose will impact perceptions or the potential for another’s comprehension. It’s precisely for all of these ambient, behavioral and situational factors factors that content strategists should be better leveraging mental mapping and modeling for the planning, design and implementation of content. Mental Modeling is far from a new thing. In fact, thinkers from the UX design community have been advocating its use for years (e.g: Indi Young’s Mental Models: Aligning Design Strategy With Human Behaviors), because it helps in understanding users’ “reasons for doing things.” The ability to leverage this type of strategy is crucial for anyone concerned with content as well, because the content that fills the design is what should create understanding for the audience. It all falls back to task completion (which I was just neatly covering off in my previous post on user satisfaction and perception metrics). From everything I’ve been able to find, the term “mental modeling” originated in Scottish philosopher and psychologist Kenneth Craik’s The Nature of Explanation, published in 1943. Possibly one of the first cognitive scientists, Craik postulated that the mind forms models of reality and uses them to predict similar future events. Fast forward 35-40 years from that book and to an expanded interest in cognitive science (particularly artificial intelligence) and you’ll find a number of parties advocating for the exploration and expansion of mental models. 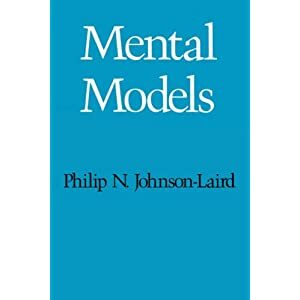 Phillip Johnson-Laird’s Mental Models: Towards a Cognitive Science of Language, Interference and Consciousness (1983) describes mental modeling as: the creation of hypothetical processes humans go through to solve reasoning problems — essentially focusing on the system of the brain and how humans perceive the problems. Dedre Gentner and Albert Stevens proposed a different way of explaining mental modeling the same year in a series of papers they co-wrote (also titled Mental Models). They defined the practice as the understanding of a human’s view of the world, himself, his capabilities, behaviors and the tasks he’s asked to complete, learn or perform. Additionally, mental models account for how they perceive the effort it takes to complete them. The 1990s ushered in the explosion of the Internet and had user experience architects, interactive designers, programmers and human computer interaction pros beginning to develop their own brand of mental modeling, which has been debated, modified and (at times) heatedly argued up to present day. Current views of mental modeling in user experience and interface design seem to hover largely around creating a support structure for making interfaces or web experiences consistent and predictable for a user. A user’s mental model should inform the designers ability to add or modify functionality or features without causing users additional pain points or retraining. I rather like Indi Young’s description for what her mental models are. So, we’re here in 2011, about to bust into 2012. I’m asking you, dear content strategists, to follow the lead of our user experience partners. I’m urging all of us to start considering and implementing mental models for content work. Better yet, partner with them and take on the exercise together. In this task you’ll provide your unique content insights to better inform a complete picture to inspire their functional designs. Now that we’ve got the past clearly behind us, lets start exploring what is unique about mental modeling for content work. For content strategy purposes, we should view mental models as a generative research technique, meaning that they should be used as an evaluative measure to frame up the mental environment in which decisions are considered, debated and ultimately decided. Many user experience professionals and agencies also refer to this as “foundational research.” This means that the efforts of our mental modeling labors may not ultimately inform content strategy to achieve business goals, but will help us in the creation of content that a user can empathize with. Mental models for content professionals will help us to understand and hypothesize concepts about our users’ behaviors (cue personal-behavioral context). We want to know their pain points, motivators, stressors and cognitive capabilities to ultimately understand how they are making a decision online. These foundational elements create the “model,” which will better inform both the designs of our systems and the content that fills them to reach our user in the deepest way possible. Once those models are created, strategists can cross tab their findings against traditional content strategy deliverables like gap analysis, messaging strategies, etc. to better inform recommendations to content creators. Sample content can then be tested and gut checked with audiences via testing panels, cafe tests or focus groups. The next logical question is how. Will dig into that next week, when we can take a deep dive into what informs successful generative research and what key usability tests or interviews you may already be doing will enable the end result. I hope you’ll stick with me and dive in head first. Mental Modeling For Content Work: An Introduction, is the first post in a three part series about adapting traditional views of mental modeling for the practice of content strategy. Tangential to this discussion, I come in with an observation that our ability to empathize with familiar scenarios impacts the learning curve when new interaction models are introduced together with new interfaces and products. For this reason, skeumorphic design should be the first choice for introducing novelty to existing consumers. Disruptive ideas need to take the form of familiar concepts, so that most people will be able to respond positively and adopt them.